Have you always dreamed of living on an all sports lake? Well, here is your chance! 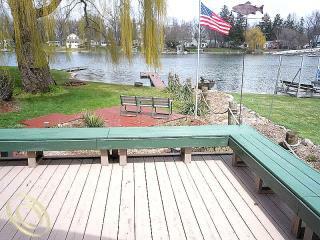 Enjoy the summer on Lake Mandon in White Lake Township Michigan in this charming, updated and move in ready ranch home! Get ready to enjoy a quiet lake with family and friends. Beautiful gardens and wonderful view of the lake. This well maintained Mandon lakefront home makes it easy to go and enjoy the lake right away – all you need is to bring your cold drinks and a boat! This Oakland County Mandon lakefront home has 3 bedrooms, and appliances are staying. The furniture is also available with this home! It has central a/ce, ceiling fans, and a water softener. Here is a list of the updates you’ll find in this Mandon Lakefront home for sale: Furnace, kitchen and baths, septic, a/c, hot water heater, roof, insulation, well pump and tank just to name a few…like I said, just move in and enjoy! Don’t delay seeing this beautiful lakefront home. Call me on my call today to arrange an appointment to see the inside, which is just as great as the views! ‹ Affordable Family Home New on Market!